When Deborah Monti was a junior at Taylor Allderdice High School in 2014, she wrote a poem that expressed her feelings about not seeing herself reflected in the images of Latinas she saw in the media. Her poem, “The Woman, the Paradigm,” won first place in Carnegie Mellon University’s Martin Luther King, Jr. Writing Awards. Monti credits the program with showing her the value in her words. She learned about the contest through her English teacher, Charles Long. “He really went out of his way to tell his students about opportunities to write. That kind of dedication to helping students branch out of the classroom was incredible,” she said. Jim Daniels, the Thomas Stockham Baker University Professor of English, established the writing awards in 1999 as a safe haven for students to discuss racial and cultural differences. To date, more than 2,500 students from across the region have participated. The awards ceremony, which features readings by winners in both college and high school poetry and prose categories and a concert by CMU School of Drama’s Gospel Choir, is the centerpiece of the university’s Martin Luther King, Jr. Day celebrations. Through their writing, students tackle difficult subjects and address the ways that racial prejudice and other forms of discrimination impact their lives. “Every year I am struck by the maturity and insight these high school and college students express. Each student is all too aware of the way they are either targets of or witnesses to the way racism and other forms of discrimination shape our social world,” said Richard Purcell, associate professor of English, who has judged entries for several years. Purcell is one of many faculty and staff members at CMU who bolsters the program. “You’ve got to have a lot of support and a willingness to accept a certain level of controversy, and CMU has given us that support,” Daniels said. Support is a common thread throughout past winners’ successes. For these young writers, the impact of the awards program reverberates long after Martin Luther King, Jr. Day has passed. Mara Cregan, a teacher at Pittsburgh Creative and Performing Arts School (CAPA) has been a long time supporter of the writing awards. Jamar Thrasher (HNZ’14) was one of the students Cregan urged to enter the contest. As a junior at CAPA, Thrasher won first place in the high school prose category in 2003 for “An Unforgettable Journey.” He wrote it in response to the people and history he encountered on a trip to Ghana, where he explored the Elmina slave castle. Today, Thrasher is working on a collection of essays inspired by life in Pittsburgh and his travels abroad as well as an academic book exploring the changing role of black fatherhood, informed by his own experiences raising a daughter. He studies the impact of communications on technology, education, culture and the economy. Connie Chan (DC’14) won third place in college prose with “American Jeans” in 2013. Though she isn’t pursuing a professional writing career, she still journals in a little red book every night before bed. Chan credits the awards program with making her think more about her culture and the importance of sharing her experiences for those who may face similar issues. She appreciated the opportunity to share her story as a second-generation Asian American, but she’s most thankful for the confidence the award gave her. Emily Nagin (DC’11)—who ended up attending CMU to study creative writing—won first place in high school poetry with “Giving Up the Ghost” in 2007 when she was a senior at CAPA. Nagin said that writing poetry provided an opportunity to think more explicitly about her identity as the daughter of interfaith parents. “I didn’t come to any clear answers, but it helped me understand that poetry isn’t about answers—it’s about the process of questioning,” she shared. Since graduating from CMU, Nagin received an MFA in fiction from the University of Michigan’s Helen Zell Writers’ Program and she has contributed to Fiction Writer’s Review, Uncommon Core Fiction Anthology and the literary journal Print Oriented Bastards. Her experience with the awards program comes full circle this fall, when she’ll be teaching fiction at CAPA and hopes to encourage a new generation of students to enter the contest. High school and college students across western Pennsylvania are encouraged to submit both personal narratives and detailed reflections on Dr. King’s legacy. Winners will see their work published, win cash prizes and read their entries at CMU on Martin Luther King, Jr. Day (Monday, Jan. 16, 2017). The deadline to enter is Friday, Nov. 25. 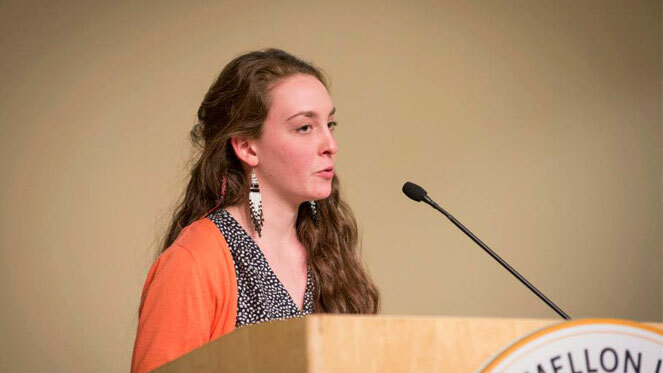 Pictured above is Deborah Monti reading her award-winning poem at the 2014 CMU Martin Luther King, Jr. Writing Awards.